On Monday we had our first Junior Sports for the year. This term the Juniors are doing athletics. We got to try high jump, hurdles, relays and running. 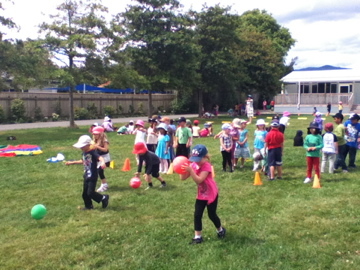 Our buddy class for athletics is E6. 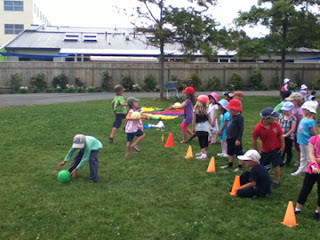 They are Year 1s and haven't done some of the activities before so we had to be good Year 2 buddies and help them. We thought the high jump was a bit tricky, but we liked landing on the big squishy mat! 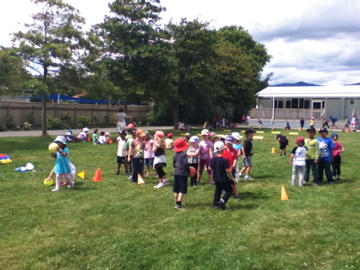 It was a lovely sunny day, so we all had to wear our sunhats. Here are some photos of us bouncing balls for the relays.